Yesterday (February 24), Washington’s House Transportation Committee passed SSB 6345 out of committee during executive session. The vote, pretty much along party lines was good news to those of us who support this effort to have a positive impact on distracted driving issues. However, much work remains in order for this bill to become law. This bill must be considered by the House of Representatives by 5:00 PM on March 5. We are requesting that you read the bill and if you agree with this effort, contact your representative and encourage them to vote yes on SSB 6345. Some of you may ask the question if ESC should take a position on “political issues”. ESC is a non-profit (501 c-3) organization. As such we are also non-partisan. However, our mission statement is pretty clear: To prevent accidental deaths and injuries by being a resource for safety training, consulting and information for businesses and citizens of Washington State and the Greater Northwest. To support related programs and legislative action that would improve safety in the workplace, on the highway, at home, and at play." 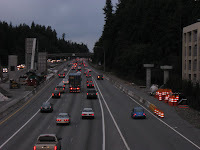 ESC views SSB 6345 as a much needed change to Washington’s traffic laws that will help reduce distracted driving collisions, injuries and fatalities on our roads. I have included links to both a summary of the bill as well as a complete copy of it for your review. In addition, I have also added a link to the WA legislature’s website in order to assist you in contacting your representatives regarding this bill. Please read this information and contact your representatives encouraging them to vote for this bill. When I was young, my family and I would get in our car and go for a long Sunday drive. Those Sunday escapes were fun and provided time for the family to wind down from the busy week. Nowadays driving has become a stressful and dangerous task. There are so many variables that can’t be predicted like traffic accidents, road work and weather conditions and what about all those other drivers on the road whom are impatient or inattentive. They drive thorough red lights, roll through stop signs, block the intersections, speed and don’t use their signals when turning or changing lanes. A what about those power struggles such as, preventing me from moving over into their lane or merging into traffic, use gestures or obscene language to humiliate or threaten me, tailgating, cutting me off, stopping short without warning and racing at dangerous speeds to get ahead of each other. These driving behaviors contribute to the already stressful day I was having. So what do I do? Do I assume that the other driver is deliberately driving recklessly and I must punish them by honking my horn, or flash my high beams or use one of my many creative hand gestures? Engaging in the same practices can escalate the situation and may cause it to become downright violent. More than likely we all have either seen or heard about someone being involved in a road rage circumstance that may have been injured or killed. For these reasons we must try to change how we these handle these situations. We can reduce the stress, by leaving plenty of time for the trip, try to get enough rest and plan your route, check the web for any road work projects and try to avoid them, be ready for long delays in traffic by having water and snacks, this helps reduce anxiety. ESC is hosting a Traffic Safety Conference on May 20, 2009 in Burien, WA. Anyone interested in raodway or driving safety is encourage to attend this 1-+day dynamic event. For more information or to register visit our Traffic Conference webpage. For those of you in Northern Idaho or Eastern Washington today starts Safety Fest - a 4-day safety conference offering a variety of free training sessions, vendor booths and more. ESC Director of Training and Consultation, Eric Tofte is hosting Evergreen's booth at this conference as well as teaching a Idaho Flagger Safety class. On February 4, 2010 The US CSB announced it is set to consider two urgent recommendations that national fuel gas codes be changed to improve safety when gas pipes are being purged (cleared of air) during maintenance or installation of new piping. This announcement grows out of the CSB’s ongoing federal investigation into the June 9, 2009, natural gas explosion at the ConAgra Slim Jim production facility in Garner, North Carolina, which caused four deaths, three critical life-threatening burn injuries, and other injuries that sent a total of 67 people to the hospital. As of July 26th 2009 you may not need a three-wheel endorsement to ride your three-wheel motorcycle if your three-motorcycle meets the following requirements. o The seat is located in an enclosed or partially enclosed seating area. o The vehicle is equipped with seat belts. o The vehicle is steered with a steering wheel. Your vehicle must meet ALL THREE of these requirements to not require a three-wheel endorsement to ride or drive. To take a motorcycle safety class and qualify for your two-wheel or three-wheel motorcycle endorsement go to www.esc.org to register for a class. Evergreen Safety Council offers motorcycle safety classes that that offer a license waiver of further testing at the DOL when qualifying for a motorcycle endorsement. Classes are available for beginners and experienced riders. Mary Walton reacting to the rampant air and noise pollution that resulted from the Industrial revolution made major technical contributions that improved the quality of life in New York City. In 1897, Mary received patent #221,880 for a method of deflecting smokestack emissions through water tanks to capture pollutants, which were then carried by the water through the city sewage system. She adapted the system for the use on locomotives as well. Later, Mary turned her attention to noise pollution. In the 1880’s many cities developed a mass transit system using elevated trains. These trains produced intolerable levels of noise. Living in Manhattan, Mary set out to solve the problem by setting up a model railroad in her basement. She used the model to develop a sound-dampening system that cradled the track in a wooden box lined with cotton and then filled with sand. After successful field trails that fitted her apparatus under the struts on existing elevated track, Mary Walton received patent # 327,422 for the system on February 8, 1881. Olive Dennis was the Baltimore & Ohio (B&O) Railroads’ engineer of service and held patents for several rail-related inventions. She was the second woman to graduate from Cornell with a civil engineering degree and held a master’s degree in mathematics and astronomy form Columbia University. In September 22, 1920, Olive began working for the B&O Railroad designing bridges as a draftsman in the engineering department. Fourteen months later, the president of B&O designated Olive the engineer of service. Her responsibilities were to improve passenger service on the B&O. She rode more than 5,000 miles of B&O track covering 44,000 miles the first year and nearly that much each year afterwards. Between 1920 and 1951, Olive contributed to passenger comfort in many ways. Among her patents is the Dennis ventilator, which was inserted in the window sashes of passenger cars and controlled by passengers. Other areas to which she contributed were the inclusion of air-conditioned coaches, dimmers on overhead lights, individual reclining seats, and stain-resistant upholstery. Olive Dennis is one of the notable women who worked in the American railroad industry. She became the first female member of the American Railway engineering Association. During her long career with the B&O, she never felt that gender stood in the way of advancement. Every now and then we find ourselves depending on the information we can get from road signs – usually when we are in an unfamiliar city and desperately searching for our destination. I’ve noticed that the usefulness of road signs seems to be inversely proportional to my level of being lost. How much help would these road signs be in that situation? I can understand the first one – sort of – as there must be a curve to the left, but we are told to keep to the right side of the roadway. However, the second one, is just plain confusing. While we may chuckle at silly signs and readily recognize the danger that can come from the confusion they may create, by their unclear massages, do you realize sometimes we give mixed safety signals to those we work with? For example, let’s say the company policy is for everyone to always wear safety glasses while in the shop area. You are only going to be in the shop for a few moments, maybe just to retrieve an item you inadvertently left on the work bench, so you don’t put on your safety glasses. What message are you sending and what example are you setting for your co-workers? You need to make a quick trip to the grocery store, and your 7-year old son decides to ride along with you. It’s only a few blocks, so you don’t fasten your seat belts. What message are you sending to your child about the importance of wearing seat belts? Everyday we have opportunity to influence the safe activities of others, whether we realize it or not. Not just by what we say, but more by what we do. Please take the time to send clear messages. If you have a photo of a strange, confusing or just plain silly road sign, please consider sharing it with us on our ESC Blog. You may be interested in seeing some creative videos produced by youth/ young adults related to the power of alcohol advertising. The videos were submitted in response to the 2nd annual contest, Free the BowlTM Video Contest, sponsored by the Marin Institute. First place winner (age 10-20 category), "No Second Chances"
First place winner (age 21-25 category), "It's Time"
"Winners" -- recaps the video contest with excerpts from several videos Videos which include messages regarding alcohol-related crashes -- "No Second Chances"; "Rid Big Al"; "FREE THE BOWL SAVE A LIFE"; "Strength to Succeed"
In 2009 there were 69 Motorcycle fatalities in Washington state, of these fatalities 62 were drivers and 7 were passengers on the motorcycle. Some of the contributing factors and statistics are listed below, courtesy of the FARS report and Washington DOL. 45 of 62 motorcycle drivers (72.5%) had no motorcycle safety training. From these fatality statistics we see that if you are a Washington motorcyclist you can substantially reduce your risk of being involved in a fatal motorcycle accident by eliminating some of the factors like alcohol, drugs, and speeding from your riding. You also see that by doing something as simple as taking a motorcycle safety training class, like those offered by Evergreen Safety Council, could reduce your likelihood of being in a fatal motorcycle accident by over 70%. You’ve heard me talk about the importance of ensuring your exits are clear, especially if they are used for emergency egress. Well, just recently OSHA proposed $233,500 in fines against Home Goods for exit access, fire and crushing hazards at its Commack, N.Y., store. Responding to an employee complaint, OSHA found exit routes that were too narrow for passage, blocked by stock and equipment, or hidden by stacks of material. Other hazards included blocked access to fire extinguishers, workers not trained in fire extinguisher use, and boxes stored in unstable 8-foot high tiers. To see the complete news release please check this link out. And remember if you need help in any of your safety training and program development, give Evergreen a call at 800-521-0778. Transportation has long been considered a man’s field, but throughout time, women have made significant contributions to the transportation industry and laid the ground work for future innovation. Since the time when travel was dominated by walking, horse-drawn carriages, sailing ships, railroads, automobiles and aviation women have been a part of innovations, explorations, and manufacturing of transportation. They became streetcar conductors, taxi cab drivers, business managers, commercial airline checkers, aerodynamic engineers, and railroad workers. Women operated machinery, buses, cranes, and tractors. They unloaded freight, worked in lumber and steel mills. They tested new airplanes, ferried aircraft and served as flight instructors for the military. Emily Roebling became the surrogate Chief Engineer for the bridge between 1872 and its opening in 1883. Her husband, Washington A. Roebling, fell victim to caisson disease (decompression sickness) during construction if the Manhattan caisson, 78 feet beneath the surface of New York’s east River. This disease left Colonel Roebling paralyzed partly blind, deaf, and mute. To keep the bridge construction in the Roebling name, Emily Roebling continued the work of her husband. Colonel Roebling taught his wife higher mathematics, strength of materials, stress analysis, bridge specifications, and the complexities of cable construction. Although her training was informal, Mrs. Roebling is considered the first women engineer, and she was, in essence, in charge of day-to-day construction of the Brooklyn Bridge. 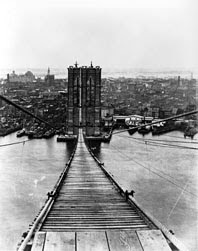 When the Brooklyn Bridge was opened on May 24, 1883, it was heralded as one of the most important construction projects of the 19th century. At the opening cere monies, Congressman Abram S. Hewitt praised Emily Roebling for he role in serving as the link between Washington A. Roebling and the construction crew. Elizabeth Bragg was the first woman in the Untied States to receive a civil engineering degree when she graduated form the University of California at Berkeley in 1876. In 1892, Elmina graduated from Iowa state College civil engineering programs. She went on to become the first female instructor at the college until she withdrew in 1905. Resources are from the Brooklyn Museum and the Federal Highway Administration. It’s now been a few weeks since we opened our Christmas presents. More than likely many of us received the latest in cool hand tools for our workshops. The general scenario is; (1) open the box, (2) identify that the tool – a new staple gun– is one you are familiar with, (3) toss the wrapping paper, box and stack of warnings and instruction booklets, (4) put the tool in your toolbox for later use. Now you have a job where a staple gun is required. Good opportunity to use the new tool, right? So, get your new “gun” and fire away. End this little story with loud screams of pain and other “colorful” phrases, followed by a trip to the local urgent care facility for a tetanus booster. Take a close look at the photo. This is one of the “new design” staplers th at takes advantage of the forward motion of your hand as you depress the trigger handle, to better drive the staple into the material. Yup: the staple will shoot out of the end of the tool that is being cradled by the operator’s left hand! Always take time to familiarize yourself with a new tool, yes – read the directions. Those few moments may just save a painful injury, a trip to the doctor’s office, and an embarrassing call to your boss on the following morning, explaining that you can’t come to work today because you stapled yourself! Washington state experienced its highest number of workplace violence-related deaths in more than a decade in 2009, the state's Department of Labor and Industries announced Jan. 29. The department attributed the sudden spike to the murders of six law enforcement officers and several workplace suicides. Of 62 work-related fatalities, 13 were on-the-job homicides and seven were suicides, according to a department press release. Prevention strategies include improved lighting, employee training and de-escalation techniques. The department also provides tips on coping with violent situations and developing a workplace violence prevention plan. As some of you may know OSHA has been looking at combustible dust hazards and the possibility of implementing rules concerning combustible dust. In the January 25, 2010 Federal Register (Volume 75, number 15) OSHA has posted its Notice of stakeholder meetings. OSHA is inviting interested parties to participate in informal stakeholder meetings on the workplace hazards of combustible dust. OSHA plans to use the information gathered at these meetings in developing a proposed standard for combustible dust. To see the complete notice check out the following link. The rule is coming, so if you want to get ahead of the game, give us a call 800-521-0778. Evergreen can provide training in combustible dust awareness and mitigation. Rotary: high speeds on approaches and usually within the circle, not pedestrian friendly. Traffic circle: often signalized and/or bi-directional, sometimes nothing more than a circular roadway with numerous “T” intersections. Neighborhood circle: traffic calming countermeasure, usually to traffic control, location would not likely warrant a traffic signal, might be in lieu of a 2-way or 4-way stop. 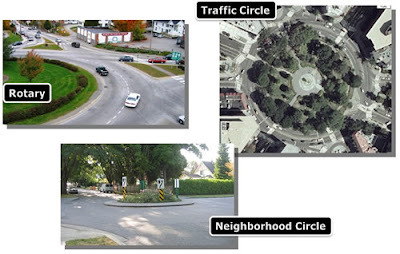 There are four points that differentiate a modern roundabout from similar or related traffic control features. A compact one-way, circular intersection in which traffic flows counterclockwise around a center island (less left turn conflicts). Other styles (i.e. rotaries, traffic circles) may have 2-directional flow and are typically much larger than the modern roundabout. The compactness helps keep speeds low and makes it easier for the driver to stay oriented. Entering traffic yields (this is true no matter how many lanes are on the approach). Other styles may have circulating traffic yield to entering traffic. Approaches are channelized to deflect traffic into the flow. Other styles may not use channelization, or deflection may not exist. Designed to slow the speed of vehicles through deflection of the vehicle path. Other styles may not be designed to slow traffic. 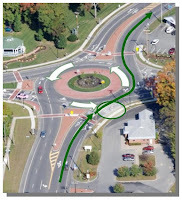 Improve safety; the roundabout has zero vehicle crossing conflict points as opposed to the 16 vehicle crossing conflict points at the 4-leg intersection. Pedestrians are faced with simpler decisions at a time and they travel shorter distance and with two less hazardous conflicts then at conventional intersections (whether stopped or signal controlled). Reduce congestion and pollution, simply less time for stopped and idling vehicles. Save money, less signaling equipment to install, less power, and less maintenance. Complement community values, roundabouts can operate quieter than conventional signalized intersections because of fewer start-ups and braking by vehicles. Roundabouts offer the opportunity to provide attractive entries or centerpieces to communities. However, hard objects in the central island directly facing entries are a safety hazard. The central island offers opportunities for aesthetic landscaping and pavement textures can be varied on the aprons. For more detailed information, go to the Federal Highway Administration. Would YOU want to be driving your vehicle, and following behind this truck-load of bricks? Neither would I. Many of us have experienced a chipped windshield due to a stone being thrown from the roadway or dropping from a loaded truck. Imagine for a moment what it would be like to have a brick crash through your windshield. Several years ago my wife and I were driving under a high overpass when a soft-ball-sized rock came bouncing down and struck our windshield, dead center, just below the rear-view mirror. I never want to repeat that event; it was both frightening and had traffic been more congested - it would have resulted in a head-on collision, as our car crossed over the centerline momentarily before I regained control. The rock penetrated the windshield, coming half way through and sticking there. The inner plastic layer of the safety glass worked as designed and prevented the rock from fully passing through the glass. Did that rock fall from a loaded truck crossing the overpass at the same time we were passing underneath? Could very well have been so. Washington State Law is very clear about the responsibility of every driver to secure the load on their vehicle. RCW 46.61.655 - Dropping load, other materials — Covering. (1) No vehicle shall be driven or moved on any public highway unless such vehicle is so constructed or loaded as to prevent any of its load from dropping, sifting, leaking, or otherwise escaping therefrom, except that sand may be dropped for the purpose of securing traction. There is no distinction in the law between a load dropped from a 105,000 lb double dump truck or any one of us making that weekend trip to the local transfer station in a ½ ton pickup or towing a utility trailer, with a load of yard waste and trash. Take a word of advice and always cover and securely tie your load so nothing can be dropped, thrown or blown from the load. If any of you have a story you’d be willing to share about lost loads, or your attempts – successful or otherwise – to avoid striking or being struck by the dropped material, please take a moment and post your story on our blog. Thanks for sharing!!! ESC also offers a free online Secure Your Load training. It was designed to inform and protect the general public. If spring cleaning, dump runs, and hauling mulch and garden debris are in your future, take 45 minutes to protect yourself and those traveling the roads behind you.